I was incredibly lucky to hear author Margaret Atwood speak in St. Louis last week. She received the St. Louis Literary Award; and with this honor, she also gave a speech and was interviewed on stage. Amazing! I wrote about the surreal experience on my blog here, if you want to hear about the ins and outs of how to see a famous author when you don't even have the proper ticket...but on WOW! 's blog, I thought I would tell you three things about writing that I learned from Margaret's speech. Know what underwear your character wears. I've heard a lot of writing advice over the years, but this is the first time someone has said: know the underwear. Of course, the audience chuckled about a 77-year-old successful literary author give this advice, but she was not kidding. Her point was that you need to know your character and setting inside and out. You need to research until you've figured out if your character wears tighty whities or Victoria Secret's latest or none at all. Think about it: if your character is going for an extremely important interview that will change her life, what underwear would she choose and why? If you can figure this out, then you know your character and she will come to life on the page. Are you a "messy" writer or organized? She called herself a messy writer--most people refer to this type of writer as a pantser. Margaret told a story that when she was starting out, she thought she should get more organized and plot her books. Then she wrote a novel based on this plotting, and she said it was terrible. She realized she is a messy writer, and she may not work like others--but what she does works for her. (Obviously). Now, I'm not here to tell you that she said anything earth-shattering like everyone should be a pantser vs a plotter. But what I learned from this moment is that Margaret Atwood tried something else, and it didn't work, and so she knows herself. She is secure in what works for her creatively. She is not scared to take risks; but if they don't pay off, she'll go back to what she knows and what works. This is something as artists we should all do! Don't take yourself so seriously! Two days before appearing in St. Louis, she was at The Emmys! In case you haven't heard, her book The Handmaid's Tale was made into a series on Hulu, and it won a bunch of awards. It was apparent that she enjoyed every minute of her experiences with this episode in her life, and she shared how she even had a cameo in the pilot episode. But the funniest part was when she talked about how "they" sent someone to do her make-up, and this person also wondered if she wanted them to do her hair. She was laughing at herself and her hair, and she just radiated joy. I thought: here is woman with so many important things to say, whose books have great success, who lived every writer's dream and attended a big award's ceremony, and who laughs about her wild hair and how no one can do anything with it. At that moment, I thought: This is why she is so successful--she knows human beings. She knows women--we all have a thing about our hair. Cathy C. Hall, who also writes for this blog, visited my personal blog and read my account of how I actually got into the concert hall to hear Margaret speak. (It was not easy.) But Cathy's comment was: "I’m often surprised about big name authors, that one can see ’em if you just show up!" It's true. I encourage you to attend one of these talks in your area if you are able. Every single time I have, I have learned something new and valuable. Margo L. Dill is a writer, editor, writing coach, and teacher, living in St. Louis, MO. To take her novel writing course, which starts October 6, please see the details here. To find out more about her, please see her website: http://www.margoldill.com. Margo--I am sooo jealous. I was not able to make this event. 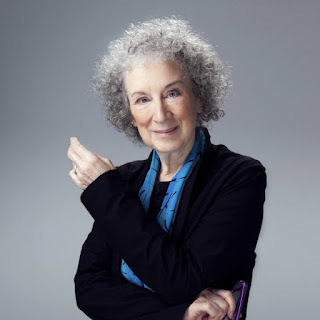 I love the book and the series (The Handmaid's Tale) and enjoyed reading the article in the Riverfront Times about her remarks lobbed at St. Louis. I know they also talked about a PBS special that will be on toward the beginning of October. They were taping the ceremony and will edit it down to a 30 min program. :) So you could look around for that too. How fun! Margaret's tips are great. Know what underwear...that stands out! I've got to see this series...y'all have been talking about how great it is. I don't have Hulu, but now I have a reason to get it. Wow, I just hopped over to your blog and read your story about getting to see her through protests...amazing story! It was meant to be. Sounds like a magical, surreal night! She is a treasure! I'm jealous too, I couldn't go either. THANK YOU for sharing her writing advice! Gosh, I wish I could've seen her. I've long admired her work, and though Handmaid's Tale is riveting, there are many more just as stunning!